Life amazes me some days. As an introvert, I can sometimes shut myself off from the world, not meaning too... just because it's part of who I am. I don't need company very often and I can get lost in my own world of writing, books, thinking, and creating... and simply forget that I need to connect. That "connection" is so important for my mental health, for sharing laughter, and for remembering that you're needed and part of your community. Last week was rather crazy. We had 3 days of constant tornado warnings, torrential rains, and just downright freaky weather. Thankfully nothing happened, and I'm glad we have systems in place these days to let us know when bad things can happen... however it meant feeling very stressed nearly all week. Then on Friday we needed to run into town to get a few things done before we left for the weekend. On the way into town... the car stalled. Just stalled... Michael was able to get it started and get it to our local auto parts store. It was too late to take it to a car repair shop and we needed the car for traveling and for work the following week. Turns out it was the alternator. We called the regular folks... Michael's brother, his sister... but knew this repair job probably might need more professional help... and thankfully I remembered our good friend Jaime had a very handy auto-mechanic husband! I called Jaime up and asked if they were doing anything. And amazingly it just happened to be a free night on their schedule. Her husband Jeremy was home and they said if we could get the car to their house, Jeremy could help Michael install the new alternator. So we were able to get there. As soon as we got there, Jaime asked us if we were hungry. We were starving... we had actually been on our way to dinner and it was 7pm. She made us hotdogs on gluten-free buns (her daughter has celiac, and that's how I know them!)... and as I was sitting on that porch with the humble dinner of a hotdog on my lap... I seriously could have cried. I just felt SO incredibly grateful. 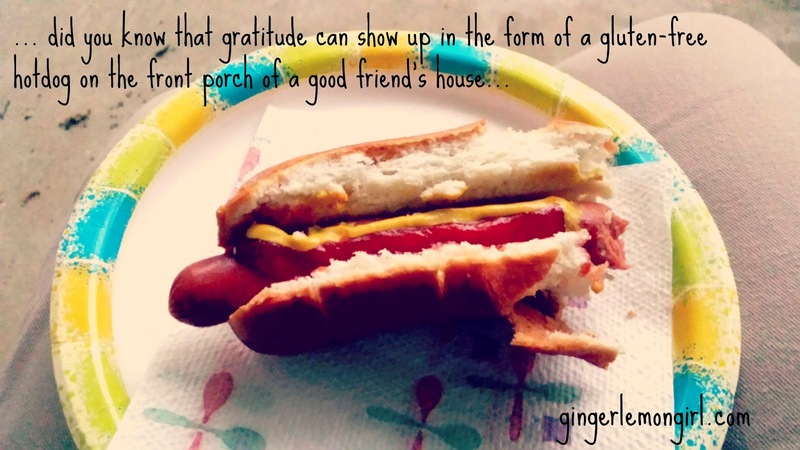 Grateful for gluten-free hotdogs and friends who offer them. For folks who welcome you to their home in the midst of a crisis (even though they think the house is a mess... Let me tell ya Jaime, your house was fine! You live there! If the house isn't a mess... then it's just a museum!)... and for the simple pleasure of knowing in this crazy world, you can still count on people. Thank you so much Jaime! Thank you for that hotdog, for sharing stories and rocking on the front porch while the husbands fixed the car (well YOUR husband mainly! lol)... and for being such a wonderful friend. I value you so very much! 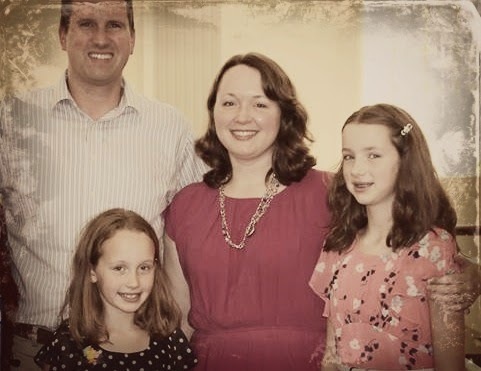 The next day we headed to Richmond, Va. to visit my lifelong friend Amy and her family. We've been friends since elementary school and those kinds of friends are awfully hard to find, let alone, keep! It was such a relaxing visit with her family. 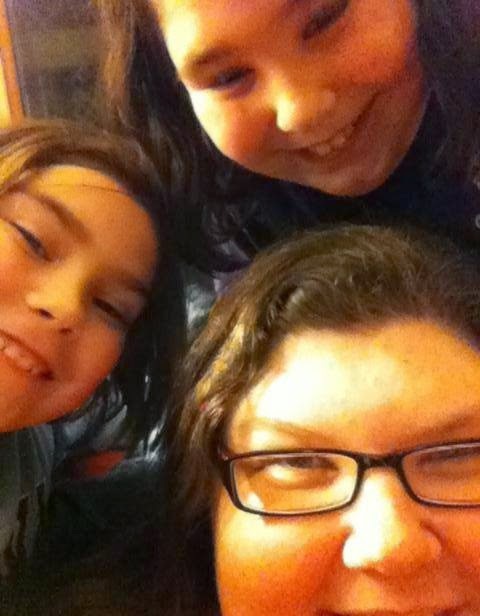 We played games with the girls. We played with their kitties and dogs, and hamsters... (these are our kinda people! haha!) Amy and her husband prepared us simple, healthy, and naturally gluten-free meals and we just felt so well fed. At one point in the weekend we were all taking a big family walk around their neighborhood and I just felt waves of gratitude coursing through my mind and my body and I just didn't even know how to explain it. It just felt good to know we had such faithful friends, such caring people in our lives. Friends who once again, welcomed us into their home, took the time to feed us gluten-free meals, and just enjoyed our company. I think it just all rang true for me, because I know what depression and loneliness feel like. I know how hard they are to work through in life. And in moments like this weekend, I'm reminded of all the goodness in life, of the friends who surround us with their support, and their love and the reminder that life is so much more. 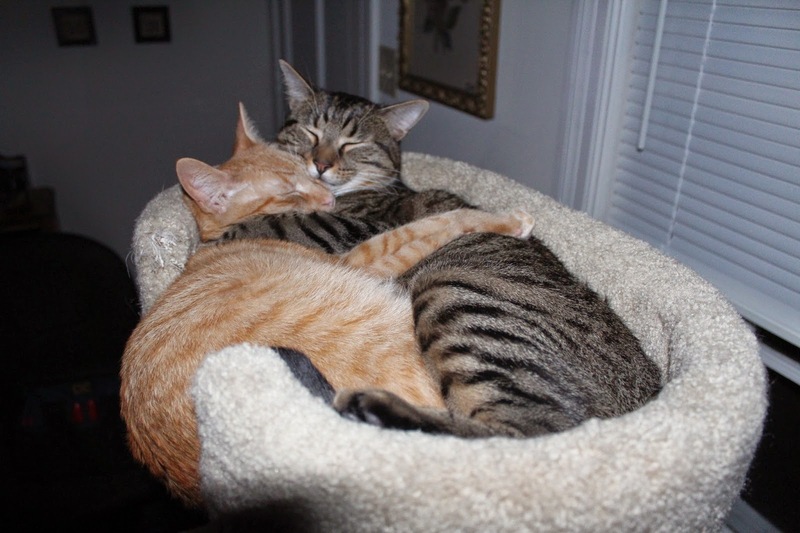 Whiskey (grey tabby) and Charlie (orange tabby) are also grateful for good friends! Have you had any moments of incredible gratitude lately? A lovely sentiment, Carrie. But remember you have these wonderful friendships because you are such a good friend yourself! You (and Michael) make the world a better place, too. Be sure to give Amy my love when you talk to her next... Dad. Carrie, your kindness and friendship over the years has always amazed me. Our family loves yours so much. Anytime you need us all you have to do is ask. Because you know I will sure ask you! :) Love you girl!!! (((((((((((hugs)))))))))) you rock Jaime!!! Thank you so much! we love you tooo! such a lovely post, and I'm so glad to see you get such comment love! That is such a sweet picture of Whiskey and Charlie...imagine if you had stopped at 4, each would be incomplete! Glad you had such an awesome weekend. Thank you Cheryl! I really hadn't thought about it that way with Charlie & Whiskey, and honestly I needed to hear that this week considering the kitty issues we've been having lately! They do love each other incredibly. They are such good buddies!